Sometimes you just have to take time out from being a busy, but incompetent, donkey farmer. On those days sometimes we just go out and look for birds or geochaches. Today, we fell through the cracks with the Doctor who lost our appointment. Time to play hooky. During the school year the state parks are great for that. 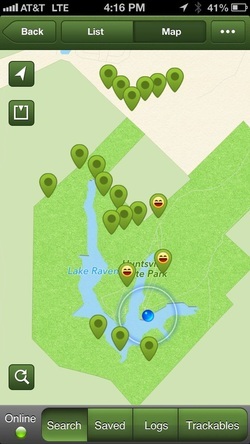 As you can see there are a lot of geocaches at Hunstville state park. We had pretty good luck and it went pretty quick. This is the place this ammo box/geocache box was hidden. It was actually pretty good and the GPS on the iphone normally gets us to within 20 feet. My favorite variation on the term Happy Camper is the more appropriate Happy Cacher. At least it's my favorite when talking about Sally. We had a lot of time left so we just sat around and relaxed. While sitting there we began to hear something. The something is in the picture. A little better look. While monkeying around we found that the camera would multiply 30 times if you hold your mouth just right. We had not known that before. Even when you blow up the picture this guy has good camo. Our bird book helped us determine this is a red-bellied woodpecker. Between the computer and the camera we get a lot better look than we used to. My next project is to get the trailer ready for the canoe. Still have a lot of time till summer and we need to get really familiar with Huntsville and Livingston. When we see anything interesting we will make a post.